Allard Kenneth Lowenstein (January 16, 1929 – March 14, 1980) was an American Democratic politician, including a U.S. Representative of the 5th Congressional District in Nassau County, New York for one term in 1969 to 1971. Lowenstein was born in Newark, New Jersey, the son of Lithuanian Jewish immigrants Gabriel Lowenstein and Augusta Goldberg Lowenstein. Lowenstein had two older brothers, Bert and Larry. His mother died from breast cancer when he was very young, and his father remarried soon after. Lowenstein was a graduate of the Horace Mann School in New York City and of the University of North Carolina. As an undergraduate, he was president of the National Student Association and the Dialectic Society. Lowenstein received a J.D. from Yale Law School in 1954. After completing his law degree, Lowenstein became a college professor and administrator, holding posts at Stanford University, North Carolina State University, and City College of New York. In 1949 Lowenstein worked as a special assistant on the staff of Senator Frank Porter Graham and he was a foreign policy assistant on Senator Hubert H. Humphrey's staff in 1959. In the 1960s Lowenstein spent time in Mississippi as part of the Freedom Summer and an interview of Lowenstein was featured in episode 5 of the Civil Rights Movement documentary Eyes on the Prize. In 1959, Lowenstein made a clandestine tour of South-West Africa, now Namibia. While he was there, he collected testimony against the South African-controlled government (South-West Africa was a United Nations Trust Territory). After his return, he spent a year promoting his findings to various student organizations and then wrote a book, A Brutal Mandate, with an introduction by Eleanor Roosevelt, with whom he had worked in 1957 at the American Association for the United Nations. In 1960 Lowenstein was a delegate to the Democratic National Convention. In 1964, he attended the 1964 Republican National Convention with his close friend and Congressional colleague Donald Rumsfeld. In 1966 he helped Senator Robert F. Kennedy in writing his famous Day of Affirmation Address, given to the National Union of South African Students at the University of Cape Town. Along with Curtis Gans in 1967, and later that fall joined by Wisconsin's Midge Miller, Lowenstein started the "Dump Johnson" movement, approaching Senators Robert F. Kennedy and, at Kennedy's suggestion, George McGovern about challenging President Johnson in the 1968 Democratic primaries. When Kennedy and McGovern both declined, Lowenstein, a delegate to the Democratic National Convention, recruited and worked for Eugene McCarthy, to whose candidacy he remained loyal, even after Kennedy's late entry into the race (before Johnson bowed out). Johnson's withdrawal from the presidential nomination process has been attributed to the impact of the "Dump Johnson" movement, culminating in the historical precedent of McCarthy's strong showing against Johnson in the New Hampshire primary. Lowenstein was elected to Congress in Long Island, New York, in 1968 but was defeated in a modified district in 1970 by New York State Senator Norman F. Lent by 9,300 votes, effectively gerrymandered out of office by the Republican-controlled state legislature, which determined the district's boundaries. Long Island's generally liberal Five Towns region had been removed from the district, and the far more conservative Massapequa added. Lowenstein captured 46% of the vote in the new district. The 1970 election was viewed nationwide as a referendum on President Richard Nixon's conduct of the Vietnam War. In 1971, Lowenstein became head of the Americans for Democratic Action and spearheaded the "Dump Nixon" movement, earning himself the number 7 spot on Nixon's Enemies List. In 1972, Lowenstein ran unsuccessfully for Congress in Brooklyn against Congressman John J. Rooney, a conservative Democrat supported by the party "machine," in the Democratic primary. After Rooney's victory was challenged and the election recalled due to allegations of fraud, Rooney narrowly won the rescheduled primary, but Lowenstein continued in the race on the Liberal Party line, finishing with 28% of the vote. After an abortive 1974 U.S. Senate bid, Lowenstein unsuccessfully challenged incumbent Republican Congressman John Wydler in a largely Republican district in Long Island in 1974 and 1976, receiving crucial support and endorsements from some local conservative Republicans as well as conservative William F. Buckley, Jr. His 52% to 48% defeat in 1974 was the strongest showing of any Democrat in that Congressional district to date, largely attributed to Nixon's recent resignation, the Watergate scandal and Lowenstein's national reputation. Lowenstein was one of the most vocal critics of the unwillingness of Los Angeles and federal authorities to reopen the investigation into the June 6, 1968, assassination of Senator Robert F. Kennedy. Lowenstein's one-hour appearance on the PBS television show Firing Line in 1975, where he was interviewed by William F. Buckley Jr., was one of the first times the American public were shown that many elements of ballistic and forensic evidence were radically at odds with eyewitness testimony and the assumption that Sirhan Sirhan alone had shot Senator Kennedy. President Carter appointed Lowenstein as United States Representative to the United Nations Commission on Human Rights and thus head the United States delegation to the thirty-third regular annual session of the United Nations Commission on Human Rights in Geneva, Switzerland, in 1977. Lowenstein served with the rank of ambassador from August 1977 to June 1978 in the capacity of alternate United States Representative for Special Political Affairs to the United Nations. In 1978 he resigned his U.N. post to run for Congress in Manhattan's "Silk Stocking District", narrowly losing the Democratic primary to Carter Burden, who in turn lost the general election to Republican S. William Green. Lowenstein was a close friend of conservative commentator William F. Buckley, Jr., who featured Lowenstein on numerous Firing Line programs, publicly endorsed his candidacies for U.S. Congress, and delivered a eulogy at his funeral. Lowenstein reportedly was Republican Donald Rumsfeld's "best friend in Congress" during Lowenstein's term of office, the two having become good friends while serving as Congressional aides in the late 1950s. Despite their party and ideological differences, Rumsfeld joined Lowenstein on the victory platform upon Lowenstein's election to Congress in 1968. In 1970, Rumsfeld publicly defended Lowenstein against his Republican opponent's attacks, only to recant and endorse the opponent, Norman Lent, under pressure from the Nassau County (Long Island) Republican organization and Nixon White House. Rumsfeld's public reversal contributed to Lowenstein's reelection defeat and the end of their friendship. Lowenstein's subsequent campaigns for Congress from Long Island against Republican incumbent John Wydler in a largely Republican district were significantly aided by active, public support from several local conservative Republicans. Lowenstein was married to Jennifer Lowenstein (née Lyman, now Littlefield) from 1966 to 1977, when they divorced, and the two had three children: Frank Graham, Thomas Kennedy, and Katharine Eleanor. Katharine Lowenstein is a victims rights attorney and juvenile justice advocate. Thomas Lowenstein founded and directs the New Orleans Journalism Project, and has worked with the New Orleans Innocence Project. Frank Lowenstein is the U.S. Special Envoy for Israeli-Palestinian Negotiations and Senior Advisor to the U.S. Secretary of State. Lowenstein was murdered in his Manhattan office on March 14, 1980, at age 51 by a mentally ill gunman, Dennis Sweeney. At his funeral in New York City on March 18, 1980, eulogies were delivered at his family's request by William F. Buckley, Jr. and Senator Edward M. Kennedy. 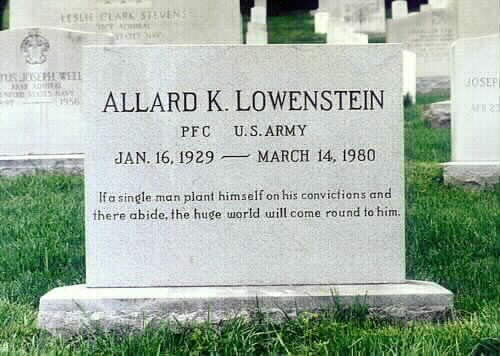 A veteran of the United States Army, Lowenstein is buried in Arlington National Cemetery. Lowenstein was well known for his ability to attract energetic young volunteers for his political causes. In the early 1960s, he briefly served as dean of Stern Hall, then a men's dormitory at Stanford University, during which time he met and befriended undergraduate students David Harris and Sweeney. Over a decade later, in 1980, Lowenstein was shot in New York City by Sweeney, now mentally ill and convinced that Lowenstein was plotting against him. Sweeney then calmly waited for the police to arrive and arrest him. Lowenstein, Sweeney, and the shooting are discussed in Harris's autobiographical book Dreams Die Hard as well as in Richard Cummings's biography of Lowenstein, The Pied Piper. Sweeney was eventually found not guilty by reason of insanity and committed to full-time psychiatric treatment for schizophrenia. By 1992, Sweeney was on 16-hour-a-day furloughs. Members of the Lowenstein family, who had opposed prosecutorial plans to seek a sentence of death for Sweeney, expressed grave concern about the supervision Sweeney would receive and anger that a murderer was being given such privileges. On June 30, 2000, a judge found that Sweeney was no longer a danger to society and granted him a conditional release from all levels of custody. Hofstra University established the Allard K. Lowenstein Civil Rights Scholarship in 2007. Yale Law School also has several programs named in honor of Lowenstein. The Allard K. Lowenstein International Human Rights Project was founded in 1981 shortly after Lowenstein's death to honor his contributions in the field of human rights and provide law students with a vehicle to continue his work. The Lowenstein Human Rights Clinic, an outgrowth of the Project, is a clinical course in which law students participate in legal and advocacy research and writing projects for academic credit. Lowenstein's papers are held as a special collection of the Long Beach (New York) Public Library and offer much material relative to his activities and his times. The Long Beach, New York Public Library is also named after Lowenstein (since the 1980s). In 1980, Lowenstein received the Award for Greatest Public Service Benefiting the Disadvantaged, an award given out annually by Jefferson Awards. An area adjacent to the United Nations headquarters in New York City is named Allard K. Lowenstein Square. In 1983, the documentary film Citizen: The Political Life of Allard K. Lowenstein was produced by Brogan De Paor, Mike Farrell and Julie Thompson and directed by Thompson. It was broadcast on PBS Television in 1984. Singer/songwriter Harry Chapin dedicated a live performance of his song "Remember When the Music" to Lowenstein, as recorded on the album Bottom Line Encore Series: Harry Chapin. Lowenstein was portrayed by Brent Spiner in the 1984 television miniseries Robert Kennedy and His Times, based on the book by Arthur M. Schlesinger, Jr.
^ a b Lowenstein's gravestone, Arlington National Cemetery; photo online on the cemetery's official website. Accessed online 28 October 2006. ^ a b c d Biography of Allard K. Lowenstein, Allard K. Lowenstein International Human Rights Law Clinic, Yale University. Accessed online 28 October 2006. ^ a b Chafe, William (1993). Never Stop Running: Allard Lowenstein and the Struggle to Save American Liberalism. New York: Basic Books. ISBN 9780465001033. ^ Hertzberg, Hendrick (October 10, 1985). "The Second Assassination of Al Lowenstein". New York Review of Books. Retrieved October 26, 2018. ^ Halberstam, David (5 March 2013). The Unfinished Odyssey of Robert Kennedy. Open Road Media. ISBN 9781480405899. ^ William Chafe, author of Never Stop Running: Allard Lowenstein and the Struggle to Save American Liberalism, interviewed January 30, 1994 on C-SPAN's Booknotes. Transcript online Archived 2011-11-15 at the Wayback Machine accessed online 30 December 2011. ^ "LOWENSTEIN, Allard Kenneth - Biographical Information". Bioguide.congress.gov. Retrieved 2010-11-20. ^ Buckley, Jr., William F., On The Firing Line: The Public Life of Our Public Figures, 1988, pp. 423–34. ^ Kaiser, Robert (March 15, 1980). "Ex-Rep. Lowenstein Fatally Shot By Gunman in N.Y. Law Office". Washington Post. Retrieved October 25, 2018. ^ "Beyond the Death Penalty: A Conversation with Family Members of Murder Victims". The Tip Sheet. Retrieved 2018-03-31. ^ "Forgiving the Murderer : Rolling Stone". 2007-10-10. Archived from the original on 2007-10-10. Retrieved 2018-03-31. ^ "Lowenstein, Thomas | Chicago Review Press". www.chicagoreviewpress.com. Retrieved 2018-03-31. ^ "Lowenstein, Frank". U.S. Department of State. Retrieved 2018-03-31. ^ Buckley, Jr., William F., On The Firing Line: The Public Life of Our Public Figures, 1988, pp. 423,433-434. ^ Blaine Harden and Nina Bernstein, Legally Insane/A special report; Voices in His Head Muted, A Killer Rejoins the World, The New York Times (July 31, 2000). Retrieved July 21, 2015. ^ "The Harry Chapin Archive at HarryChapin.com". harrychapin.com. Retrieved 2018-03-31. Chafe, William H. (1998). Never Stop Running: Allard Lowenstein and the Struggle to Save American Liberalism. Princeton University Press. ISBN 0-691-05973-X. Retrieved April 19, 2009. Cummings, Richard (1985). The Pied Piper: Allard K. Lowenstein and the Liberal Dream. InPrint.Com. ISBN 0-9673514-1-3. Retrieved April 19, 2009. Harris, David (1993) . Dreams Die Hard: Three Men's Journey Through the Sixties (2nd, revised ed.). Mercury House. ISBN 1-56279-034-X. Retrieved April 19, 2009. Olson, James Stuart (1999). Historical dictionary of the 1960s. Greenwood Publishing Group. pp. 281–282. ISBN 0-313-29271-X. Retrieved April 19, 2009. Stone, Gregory; Lowenstein, Douglas (1983). Lowenstein: Acts of Courage and Belief. Harcourt Brace Jovanovich. ISBN 0-15-154742-4. Retrieved April 19, 2009.